Organic Cranberry Lemon Black Tea Blend from Boston Tea Co. Enjoy this tartfully-sweet tea whether it’s morning, noon, or night! The perfect blend of our premium organic Chinese and Indian black teas with organic cranberries and lemon will leave you taste buds dancing with delight! I wasn’t sure how I would like this blend, because even though I’ve enjoyed many cranberry flavored teas as well as quite a few lemon flavored teas – to have these two tart fruit flavors together in one tea seemed a little too tarty for me. But this is alright. It’s not my favorite tea that I’ve tasted from Boston Tea Company, but, I’m enjoying it. The flavors of cranberry and lemon go together surprisingly well. I usually see cranberry and orange as a combination but seldom do I see cranberry and lemon. And it’s a nice combination. Yeah, it’s tart, but it’s still tasty. I think what really saves this tea for me and makes it tasty instead of way too tarty is the black tea base. It’s a smooth, robust black tea. I taste sweet notes of malt and these sweeter notes of the tea as well as it’s strong, bold taste seems to take some of the attention off the fact that we have two sour fruit flavors in this blend. Not that the tea base overpowers the fruit notes, but, it manages to curb some of the really sour notes so that it tastes just a little less tart than I anticipated it to taste. So I’m able to experience some of the sweeter notes of the berry and the bright, refreshing flavor of the lemon without feeling that urge to pucker when I take a sip. I steeped one of these silky pyramids in boiling water for 3 minutes. It produced a flavorful, aromatic cup that is not too tart, but it is a bit more tart than it is sweet, so if you’re one who fancies a sweeter cup, you might want to add just a pinch of sweetener to soften the sour just a bit. I enjoyed it as is, and I tend to be a little sensitive to tart flavors. This tea just “toes the line” at being a little too tart. It’s very tart but not quite there. Overall, a pleasant tea – this makes a really tasty and refreshing iced tea. I think this is even better iced than hot – the tart notes mellow out just a little bit and make for a very smooth and juicy tasting drink. Beverage Black Blend blended Boston Tea Boston Tea Co China Chinese Company Cranberry Drink flavor Flavored food hot Iced India Indian lemon Organic pyramid Review reviewing Reviews sachet TeaLeave a Comment on Organic Cranberry Lemon Black Tea Blend from Boston Tea Co.
Keep on rockin’ with Moroccan! Mint, that is! Try this Chinese Gunpowder variety of long-leaf green tea, hand-rolled to form tiny pellets and blended with fragrant Moroccan Mint leaves. When steeped, the tea leaves unfurl, releasing their delicate flavor which, combined with the mint, makes for a uniquely refreshing cup every time! It’s lovely iced, too! I love many different types of flavored teas, and I wouldn’t even say that Moroccan Mint is my favorite, but I will say this, I’d be hard-pressed to find a tea that is more refreshing than a Moroccan Mint! The fresh, cool taste of mint combined with the delicate, sweet flavor of a high-quality Chinese gunpowder green tea leaves my palate feeling clean and refreshed while invigorating me from within. This Moroccan Mint from the Boston Tea Company is splendid! It has the flavor I’ve come to expect from a top-notch Moroccan Mint tea. It’s minty, but not overpoweringly so. It’s sweet and tastes fresh and zesty, and it’s cooling even when served hot (which is how I’m sipping it now). Before steeping, I poured some of the leaves into my palm, just to get a good look at it. I could see the tiny pellets of the gunpowder tea tossed amongst the bits of mint leaves. I liked that while the mint leaves were broken to uniform size, they were not pulverized into dust and the pellets appeared to be pretty uniform in size and shape too. And – no surprise! – it smelled minty fresh. While this is delicious hot, it is equally as nice served iced and as I said at the start of this review, it’s easily one of the most refreshing teas out there – something that you’ll want to keep stocked up on as these hot summer days seem to go on and on! This is great for cold-brewing too! You’ll do the cha-cha over our Chai tea! Ever so popular, worldwide, Chai is a centuries’ old tradition of Indian culture. Boast to your friends about Boston Tea’s aromatic, cheery blend of black tea with sweet fragrant spices. Simply add a pinch of sugar to bring out its rich flavorful spices of cardamom, cinnamon, ginger, cloves, and anise seeds. Top with a generous splash of milk and sensually savor each sip! Seldom do I make chai lattes anymore, usually, when I drink a chai, I drink it straight. Sure, I still do love the creamy, spicy goodness of a chai latte, but I’ve been discovering just how lovely a chai tea is without the milk. When brewed in boiling water, and just a touch of turbinado sugar is added to enhance the spices. It becomes a lovely, warm and spicy blend that is delicious no matter what the weather is like outside – at the moment, it’s 72°F outside – a bit on the warm side and the sun is shining brightly, but, I still find this warm, spicy chai (served hot, no less!) to be absolutely refreshing. When I first opened the package, I could smell the cardamom. It had a delicious, exotic warmth as well as a hint of bright citrus tones and I could feel my mouth start to water just from experiencing the aroma of this chai. I stood impatiently over my timer today … I WANTED – perhaps even NEEDED – this tea! And this chai was indeed worth the wait. It is gently sweet from the turbinado sugar (I added about a half a teaspoon), but more than the sweetness I notice the depth of the enchanting spices. I like that the ginger and cinnamon do not overwhelm the cup – which is so common in chai blends, it seems – they are more of a background flavor. The cardamom and the cloves tend to be the strongest spices here. The anise is also in the background, offering its unique sweetness to the overall flavor. I like that I can taste the tea here too. It is rich, a little malty and smooth. It is not bitter (although, I wouldn’t recommend over-steeping it, as that may cause bitterness), and it finishes with a tangy astringency. The spices compliment the black tea quite nicely, providing a cup that is robust with black tea flavor as well as invigorating spices. I really enjoyed this lively chai, and I like that it is available in both loose leaf and sachet form. At the time of this writing, I noticed that this is currently out of stock – I hope their supply is replenished soon! Calmly sit and be cradled by the sound of stringed instruments gently being played while you sip this delicately flavored black tea. There’s a soothing symphony in every elegant cup! Boston Tea’s loose leaf tea reflects the passion projected in our company’s motto: “Life, Liberty and the Pursuit of Tea.” Our full leaf tea embodies natural beauty, rich aromas, and the finest quality that our worldly master tea blenders ardently seek. Found in the lush plantations of Sri Lanka and mountainous regions of India and China, Boston Tea blends its teas to create the heartiest, strongest and most flavorful cup. Enjoy! This is an extraordinarily smooth, mellow cup of Ceylon tea. Of course, most Ceylon teas that I encounter are mellow and smooth; it is in the nature of the Ceylon tea to BE smooth and mellow. But there is something a little more about this tea… a little extraordinary. First of all, it has a richness to it that I wouldn’t normally associate with a Ceylon. It has interesting, complex layers of flavor – a deep fruity note, delicate hints of flower, a honey-like flavor and even a somewhat woodsy tone and an earthy characteristic. This is a tea that is hearty enough to enjoy as a breakfast tea and yet special and flavorful enough to sip in the company of close friends and family. It would make a spectacular iced tea (I’m imagining a pitcher of this with thin slices of lemon generously added to the pitcher – what a refreshing image!) and is very good served hot too, perhaps with a dollop of honey and a splash of milk. One thing I like about this tea is that the smooth, mild flavor of it allows the drinker to become a little adventurous. By being a little adventuresome with your additions, you can really bring out some surprising qualities in this tea. Try dropping a few chunks of crystallized ginger to it and enjoy the spicy and sweet notes. It is equally as good with all kinds of fruit – not just citrus! – and there are many different flavored syrups out there that you can try. This tea offers you that kind of freedom to experiment! Despite its yielding nature to these types of additions, this tea is also very pleasant to sip all on its own: rich and robust, yet sweet and smooth. This is a delightful cuppa! DETAILED DESCRIPTION: Spice up your cup with fragrant Asian ginger and the sweet essences of juicy peaches and apricots, that blend beautifully with our premium Chinese black tea. 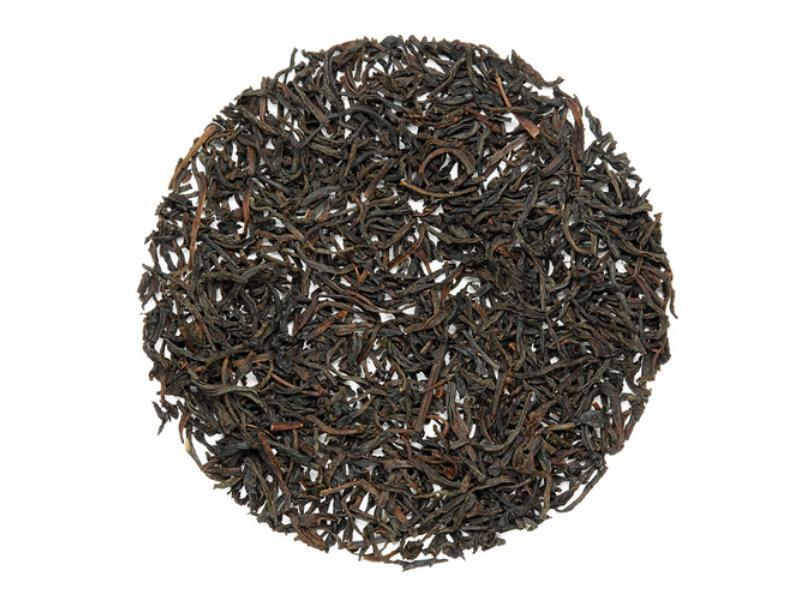 Take a peek at the delectable mix of our fabulous full-leaf black tea in our clear-topped copper tin! HEALTH: Rich in antioxidants, including flavonoids, ie: catechins and polyphenols, these substances found in tea provide many health benefits, such as: prevents tooth decay, lowers cholesterol and assists in preventing heart attacks. Boston Tea’s loose leaf tea reflects the passion projected in our company’s motto: ‘Life, Liberty and the Pursuit of Tea.’ Our full leaf tea embodies natural beauty, rich aromas and the finest quality that our worldly master tea blenders ardently seek. Found in the lush plantations of Sri Lanka and mountainous regions of India and China, Boston Tea blends its tea to create the heartiest, strongest and most flavorful cup. Double your tea-drinking pleasure; try any of these flavors hot or iced! I LOVE Apricots and Peaches. I always have! As a matter of fact…when I was a toddler my mother used to buy me dehydrated apricots and I would eat them right out of the bag! I mean, what little kid voluntarily eats Apricots, eh!? It’s like I couldn’t get enough of them! I still like them to this day! I also like Ginger in many things…mostly food. Usually I don’t gravitate to the Ginger Teas that I see right away because the ones I have had in the past are either “Too Much Ginger” that is overwhelms the rest of the ingredients or it’s “fake tasting”. 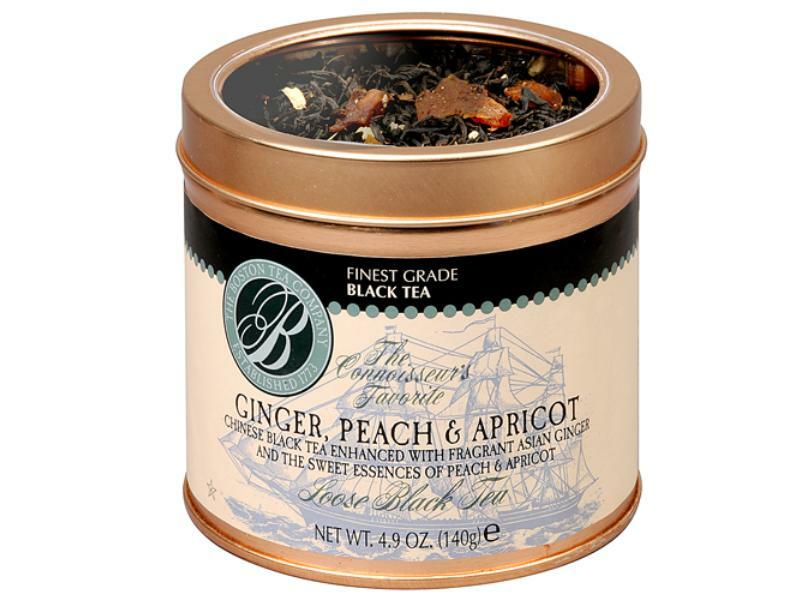 This Ginger, Peach, and Apricot Flavored Black Tea from Boston Tea Co is terrific! Ginger bits, lush peaches and apricots blended with Chinese black tea and enhanced with natural ginger-peach flavor add up to a delightfully sweet-tart refresher. That pretty much sums it up! My thoughts are that the Peach and Apricot seem to be pretty good friends in this flavored black tea. It seems to have the perfect amount of ginger for my liking! So far…this is one of my favorites from Boston Tea Co.